Facebook wants your photos. All of them. In fact, word is that they’re working on a feature for iOS that’ll do just that — upload each and every photograph you take automatically. It’s a feature dubbed Photo Sync, and it’s already available for Android. There have been a handful of apps and social networks that have started offering this capability recently – Dropbox and Google+ are two to spring to mind straight away. I’m not fond of the idea and have opted out of the offer on both of those – mostly because I just have never, ever thought to myself ‘Hey, I really want to share every single photo I take with the world’. And of all the places I really don’t want to share everything with, Facebook comes very close to top of the list. They don’t exactly have a stellar reputation for having user privacy at the top of their list of priorities last I checked. What do you all think? 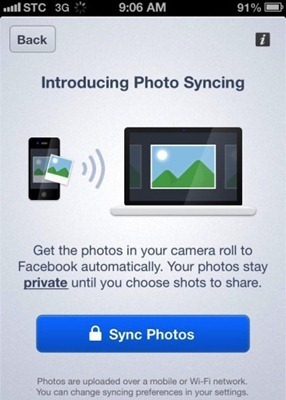 Do you want your iPhone uploading every single pic you take automatically to Facebook? DO NOT WANT!!! This is another in a long line of terrible ideas for Facebook. No way. If this ever becomes an option, I will be turning it off first thing. Why, would anyone want to share EVERY single picture? That is going way overboard. I don.t need to overload my FB. There’s already a great app called PhotoSync that does what I want – sends photos and videos to my PC. That’s where I want them. I don’t want them clogging up Facebook unless I pick and choose precisely which ones I want there.